This is now possible with a self-hosted WordPress blog. There is a way to send private messages similar to how you do this on message boards or even on Facebook messenger. Today I’d like to share some plugins I found to do this. Each plugin is specific to doing certain things so be sure to evaluate each plugin below further. There are many reasons for using a private message system on a blog. If you have multiple authors or paid staff working for you, you need a way for people to contact one another quickly without having to use that makes them totally leave the blogging area. Without further ado, here are the plugins we found suitable for the latest WordPress version. The bbPress Messages is a simple but yet powerful private messaging system for people using bbPress forum software. You will find it easy to get this module set up and usable by your members in no time. The Front End PM plugin is a full functioning messaging system from the front end as the title states. The messaging is done entirely through the front-end of your site rather than the Dashboard. Still, don’t understand? The pro version is worth the investment. Watch the video below. YoBro is a 2 in one plugin. It can add a live chat on your blog or a private messaging system. This plugin is ideal for people who provide a service through their blog or have a business attached to the blog. Take a look at the demo version to learn a lot more. 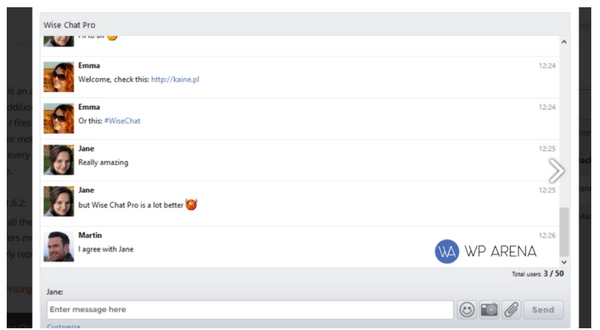 The Wise Chat Pro is a robust messaging system for WordPress that does not need its server. The message system has a similar feel to the old Facebook messenger system but yet is featured right for WordPress powered blogs. You need to explore this plugin as it is awesome. Hope, you will like our collection of the Private messaging system in WordPress. Here is another great list and email guide for how to Integrate An Email Management System Into WordPress. Do let me know me know if you have used any one of the following plugins listed above. If I missed one, please let me know so I can take a look at it and if possible, add the plugin to this list. I am using front end pm. It is a wery nice plugin with a lots of functionality.